It's hard not to feel that the future of the suit lies in more practical cloths than the fine worsteds of the past 30 years. We may move towards a situation where these cloths will be reserved for formal wear, while everyday suits and jackets are made in more hardy tweeds and woollens - suited both functionally and aesthetically to modern lifestyles. You can see this today in mills pushing more ‘performance’ materials, and in the collections of people like Ethan Newton at Bryceland’s with its super-heavy hopsacks. And it is, of course, a return to more traditional materials of suits in the first half of the twentieth century. When a labouring man might only have one or two suits, and they had to last. It was with these ideas in mind that I commissioned this suit last year in green/grey covert cloth from Sartoria Vergallo. Covert is a steeply woven twill cloth made from a tightly spun yarn. It is mostly associated with the classic covert coat, which is top-coat length, with a fly front and short lapel. The density of the cloth makes it more wind and water resistant than other weaves, and generally harder wearing. This covert from Vitale Barberis Canonico via Drapers is not coat weight, at 14oz/440 grams. But it is heavier than most suit cloths, and the weave will make it pretty robust. Certainly better for cycling around town on a Boris Bike than any fine worsted. The other reason I was interested in covert cloths was the colour mixes. Coverts are usually light brown or dark green - fawn or olive - but have at least two colours in the mix, sometimes three. The proportions of those can make for some very different effects. This one (8743 in the Salt and Pepper & Covercoat bunch) was picked to be a dark brown/green combination, but it has turned out more green than expected - and that a rather greyed green. That suits me fine, as it looks rather more urban and might even be wearable in the office. But it should serve as a warning to be careful if picking similar covert cloths from bunches. I used Gianni from Sartoria Vergallo because he is always interested in new ideas (see my adjustable half-belt loden coat, and vintage-silk houndstooth with leather undercollar) and because is very good value: two-piece suits start at €2200 still, including VAT. He does a very natural shoulder option too, which I chose here. Not really Neapolitan, but very soft in the shoulder padding and dropping off immediately down the sleeve. 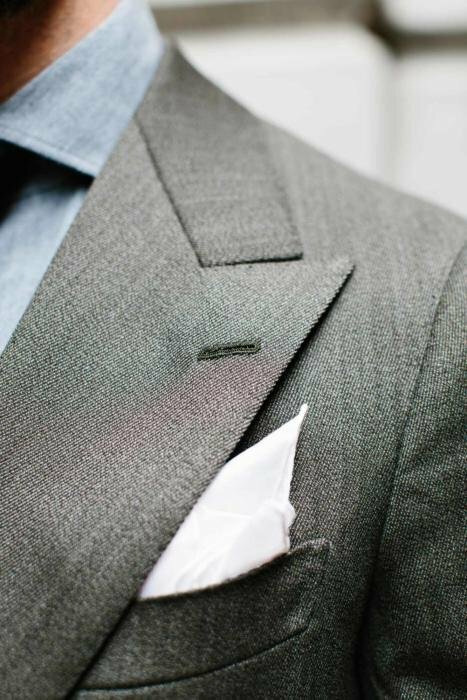 The finishing isn’t of the same level of other top tailors - as can be seen in the lapel buttonhole above - but still decent. This is actually part of a three-piece suit, as I hope to also wear the waistcoat alone with the trousers (but not with the jacket). That waistcoat has a self back and central box pleat, which I will show separately at some point. The jacket may also be casual enough - thanks to its rough material - to be worn on its own. Readers will be familiar with my liking for grey shirts, given how non-traditional and non-corporate they normally appear. But a olive covert works equally well with blue shirts, and rather more traditional silk ties. If the jacket were single breasted, it might even be a nice option for a more casual office - clearly not a business suit, but a big step up from chinos as well. Dark-brown alligator shoes from Gaziano & Girling. You can follow the discussion on Olive covert-cloth suit, from Sartoria Vergallo by entering your email address in the box below. You will then receive an email every time a new comment is added. These will also contain a link to a page where you can stop the alerts, and remove all of your related data from the site. I’ve never liked the covert cloth, but it looks good here. I like the cut of the suit a lot too. When ordering a suit, if the budget is limited and there is no need of a conservative cloth (worsted), I find rather convenient to order something you can wear as separates: Linen, Fresco wool, flannel, tweed and cotton. Indeed. The three way suit! Which fabric and colour would you recommend for a first (casual) three way suit for autumn/ winter? It seems to be bit harder for the colder seasons than for spring summer when several linen and cotton options come to mind. Corduroy, if you like that (look up mine) followed by a covert like this. Not the biggest fan of both corduroy and covert (even though your corduroy suit looks great). Can you also recommend a donegal tweed similar to your Dalcuore suit? Could you explain why? Thanks! The heavy cloth drapes beautifully. And I am sure, this would be a very practical suit. This is a very interesting suit in this cloth, Simon. The green I find a welcome change to grey/navy though I hadn’t considered covert cloth for a suit before, probably due to its race goer or country coat connotations. Particularly good looking is the mixture of the relaxed shoulders with those bold lapels of the DB. I’m not sure why you wouldn’t automatically wear this in an office; I am perhaps not as au fait with office etiquette. Your comments here and in other posts about the future of suits are interesting; definitely not a required item to wear in many places so any future articles on alternative cloths etc would be welcome. 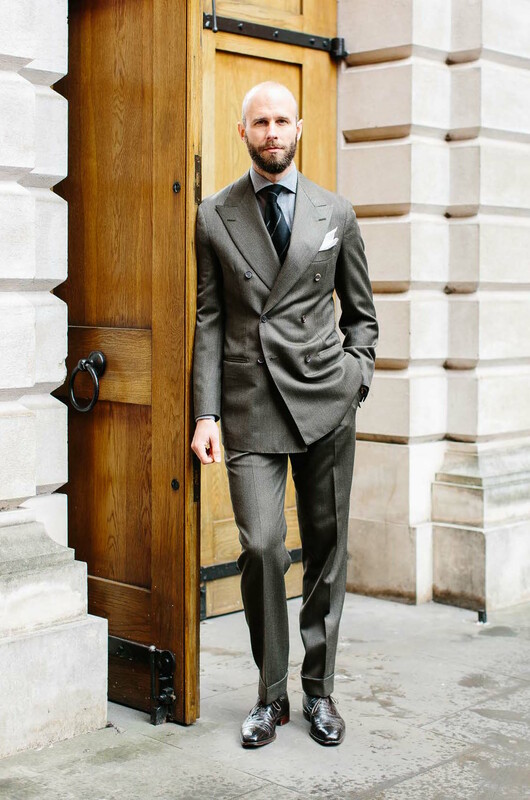 One of the most beautiful suits I have seen on your blog. Especially like the Tautz style cut of the lapels but I fear the suit is more suited to the days before central heating. Do you not think it would be much too warm to wear in a modern office especially with the waistcoat (a nice but somewhat anachronistic touch for a DB suit)? As mentioned, I wouldn’t wear jacket and waistcoat together. And yes, the jacket would sometimes be too hot to wear around the office, although sometimes not with the way the air conditioning is jacked up! Are you happy with the fit? I know you say that fit is difficult to judge from photos but the back by the armholes doesn’t look particularly clean. There’s always some excess there, otherwise you wouldn’t be able to lift your arms up without dragging and stretching the back. Yes it is a good fit, the only thing I might tweak is the closeness of the jacket in the waist at the front. Given the weight and tightness of weave how comfortable is to wear Simon? A suit made of a covert fabric? Will your next one be made from aluminium foil perhaps, or maybe recycled plastic? I’ve never come across covert coating used for a suit. Given the density of weave, is it not a tad stiff, as it tends to be as a coat? No, it’s actually very soft and wearable, but it’s not as heavy as most used for coats. I love covert cloth. It is nice to the touch and feels hardy and substantial. Gianni recommended a mid-grey covert for a pair of trousers he made me and said that covert is always a good investment. They are, hands down, my favourite pair. I’m hoping to get another pair made in a different colour at some point. Olive looks like a nice option. It is amazing how different cloth colors can look once they’re made into a jacket. I recently commissioned a summer jacket in a loose-weave hopsack, which I thought was a rich oatmeal color. When I got it back it was much more grey than I expected. Still works, but is less casual than I had hoped for. Any tips on how to “scale up” a color? One of the nicest and perhaps unusual suits in your collection. In many ways it is counter-intuitive but a very successfull commission for it. For many (particularly British), readers covert is a country cloth, yet with the grey it is splendid. I know you like the cord suits but I see this as far more flattering and stylish. Also, despite some minor points it looks to be very well cut (also another plee for more pictures, lets also see trousers sans jacket, it is impoosible to guage cut etc. without seeing the waist). At 14 oz does this compare to the heavy antique flannels and worsteds? I was also curious to know how it might compare with heavy serge? The price seems very competitive – good to know – (this did include cloth price?). Overall, it seems a suit that could be worn in many situations…town, country, casual, evening. One of your best yet, congratulations. I love this, for me it is a versatile & very wearable suit & I might even wear the waistcoat as well… As another comment asked I am also not sure why this wouldn’t necessarily be acceptable in most office environments. You have made observations over the years about the acceptability/formality of certain suits in an office situation yet at the same time we are seeing more casual work attire – this seems a bit contradictory… Would someone really be frowned upon at a workplace for wearing a suit that was for example not black, charcoal or navy in a ‘fine worsted’? Gorgeous suit! Love the color. Also love the lapel width. How wide are the lapels? 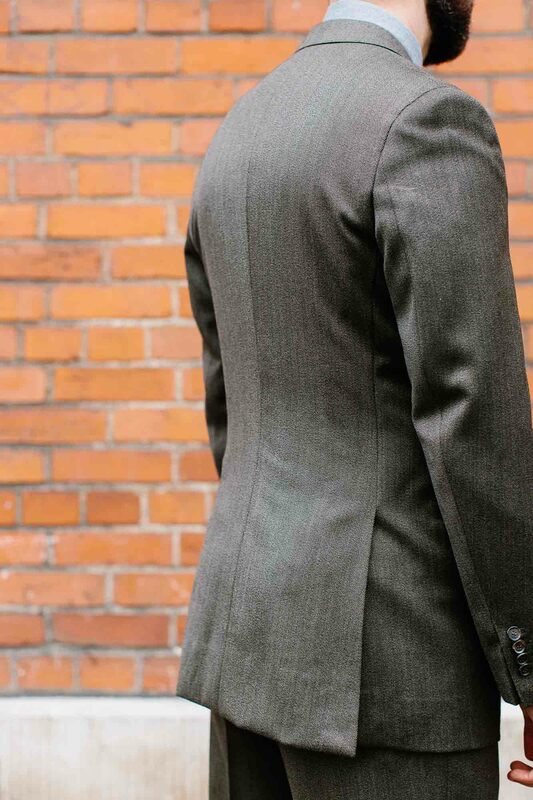 A question on jacket length if I may: you’ve previously written that the jacket should cover the rear. But what is meant by that? Should the jacket extend all the way to the upper back thigh? I’ve read elsewhere that it should extend to where the buttocks start “sloping back” to the thigh. Do you agree with this? Yes, that’s a good guide. Thanks Simon. 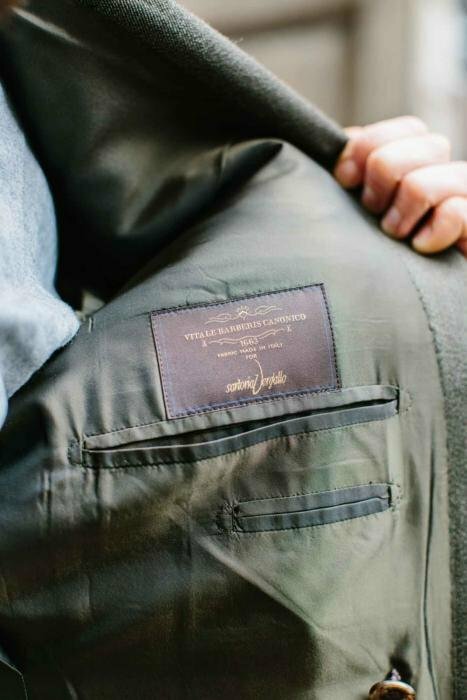 Can a bespoke jacket that’s a touch to short be lengthened (assuming there’s enough inlay)? Or is this not recommended? I had a beautiful jacket made recently which was supposed to have a back length of 30 inches (which is the ideal length for me, just enough to cover the bum) but ended up as 29 and 1/4 inches. I think there’s enough cloth inlay to lengthen about 1 inch. Can this ever be done satisfactorily? Thanks. But would 3/4 inch lengthening really affect the balance? How is the jacket lengthened from the shoulder? It’s only a small difference, but then bespoke is built on those differences. How does the Vergallo fit and house style compare to Caliendo? I’ve just collected my Donegal tweed jacket from Gianni. I’d asked for a Neapolitan sleeve head and I have to say, he’s done a cracking job. A very natural curved shoulder. Very happy indeed. As Simon has mentioned before, he’s very accommodating. On this general theme Simon, how about synthetics…you know, a polyester suit? (well perhaps not). I grew up hating synthetics (my eyes would tear up from the scratchiness, and static electricity, not to mention their lack of breathe-ability). All my underwear had to be cotton, etc. And as they aged/washed out, they would deteriorate drastically from their new look, as opposed to naturals which would actually become softer, and look better..
Now I find my favorite briefs are micro-fibre. The same with some of my shirts, and pants. Is there anything on the horizon or the near future for similar moves in the world of more formal dressing? what would you think about a dark blue blazer as to go piece for autumn and winter ? After I read your article I thought about commissioning one to complement my light navy hopsack blazer which I use in the other half of the year. Fox Brothers offers a cloth at weight of 18/19 oz (which could be a bit heavy) but I thought the midnight colour might balance the coarseness of the fabric. And would you think it would work at this weight or would be either to stiff or to warm? I noticed that you mentioned above that the suit is “soft and wearable” because it is not as heavy as many covert cloths. I have a midnight blue blazer but find it looks almost black in sunlight and some other lighting. I find it less versatile than navy. Perhaps due to its strong contrast with pale colours that usually work well with navy. Thank you both for your kind advice! – “It’s hard not to feel that the future of the suit lies in more practical cloths than the fine worsteds of the past 30 years”. An assumption with far reaching consequences! – And what you seem witnessing as a trend toward s a “more traditional materials of suits in the first half of the twentieth century. When a labouring man might only have one or two suits, and they had to last”. 1) since this jacket is DB, whereabout would you locate such a suit in our everyday life? 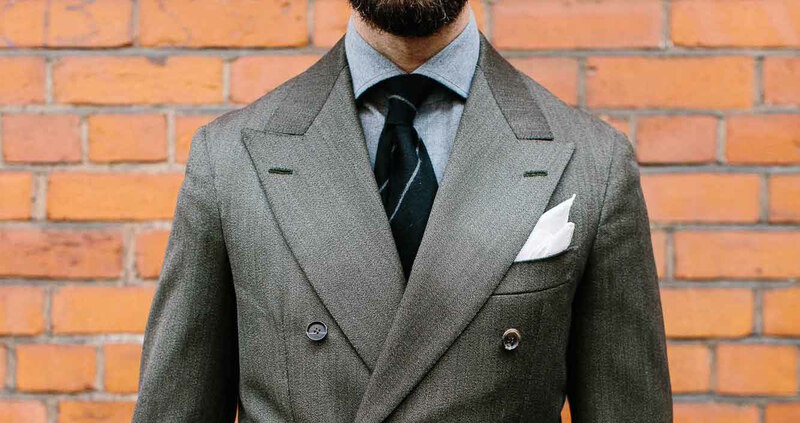 2) Sartorially, and functionally speaking, does it belong to the same category as your AS’s corduroy suit (https://www.permanentstyle.com/2016/09/the-corduroy-suit.html) and the one made by Pirozzi (https://www.permanentstyle.com/2017/01/corduroy-suit-from-sartoria-pirozzi-naples.html)? All in all, your perspective on the current trend with respect to suits and the alternative option you have been assiduously working out makes sense to me. Hi Simon, have you ever heard of Sartoria Visone, Viale di Augusto, Napoli? Simon, great article. I love this idea of the return of “more practical cloths” for the future of everyday suiting with the added benefit that they make great 3-way suits. I have actually been thinking about purchasing two such suits to cover most of my suiting needs (no more worsted). I need to wear suits or sportcoats a few times per month in an environment where a navy blazer and slacks is the standard. Do you have recommendations for fabric and color to fit the formality and to be durable enough for travel? My thought was a heavier hopsack and a flannel both in blue slightly lighter than navy that will pair well with grey trousers. Thoughts? Thanks. They both sound like nice options, Daniel, but bear in mind that the vast majority of cloths, no matter how casual, do not make good three-way suits. It’s unfortunate, but true. So I wouldn’t recommend flannel as a separate jacket, and the hopsack would have to be suitably casual in style (patch pockets, contrast buttons etc) to make it a good jacket. And at that point it might be too casual for a suit. The buttoning stance on this jacket is significantly higher than on your Anderson Sheppard DBs. I prefer the Savile Row sense of proportions. Good point, and yes I would probably agree. Simon, cut looks beautiful across the back, but I’m wondering if that sculptural form has come at the expense of some mobility and comfort? Simon, do you have any idea about bespoke shirts from Sartoria Vergallo in terms of price, quality, fit? Looks good on you, Simon. The cut, color, styling. And after all that’s what really matters, right ? I’ve been following your blog for a long time and I not only admire your sartorial savvy, but your great command of English (pleasure to read: I am a Professional translator, so words are my stock in trade. Now, I have been looking for a covert cloth in green to make a suit. How can I get hold a this very fabric? Hi JP. Thanks, that’s lovely to hear. You can get the cloth through your tailor – the number is listed in the post. It’s not available to buy directly from the mill currently. as it is perfect time of the year for this suit, what is your retrospective? Do you wear it often? Do you judge it as very practical? Yes, it is very practical. I really like it. I don’t wear it a huge amount, but just because it’s double breasted. I should perhaps have had a single breasted – I would have worn it more. Which fabric would you recommend for a spring/summer (woolen) equivalent of a more casual three way suit? Lightweight linen. Trousers won’t be great, but you need that texture that comes with the lighter weights for the jacket to be casual enough. I don’t really like lightweight linen due to heavy wrinkling. No woolen fabric (blends probably?) which makes a proper three ways jacket and trouser? What about Crispaire? Long time reader here and my husband wardrobe has beneifted greatly ever since I started following your website. I understand your area of expertise seems to be man’s fashion but can you suggest some woman tailor as it seems pretty unfair that only the boys get to enjoy nice suits! Yes, I’d certainly recommend Kathryn Sargent for women’s tailoring, and both Davide Taub at Gieves & Hawkes and Edward Sexton. How do you think navy covert would work for a winter suit? I want something warmer than the normal 13oz or so worsteds commonly available and I don’t really like the look of navy flannel (flannel looks much better in grays I think). Any other good cloth options here? I have a suit in what must be this exact same fabric, RTW by Ring Jacket. I don’t think I would have thought of getting it bespoke, as the concept of it seems unusual – a green suit in an overcoat cloth?!? – but it’s one of my favorite suits. It’s surprisingly versatile. The olive color is subtle but really comes alive in the sunlight.